In recent years we’ve seen some of the best and worst that comes from pro football players segueing into the broadcast booth. Tony Romo has quickly become a savant who elevates every game that he calls. Meanwhile, Jason Witten’s run with Monday Night Football has been a trainwreck (even if it’s not all his fault). It was hard to tell before they actually got in the booth and started calling games just how good or bad it could get, but that’s the big unknown that comes with the career path. The point is, the more experience you can build up, the better. Wisely, that’s what Greg Olsen has been doing in recent years. He worked as a Fox game analyst for a week a couple years ago and then did work for ESPN in the lead-up to the Super Bowl. Since then people have been wondering when he’d retire for good and get into the booth. When he returned to the NFL this past season, some questioned if it was the right move. When he re-fractured his foot in the first game and then later ruptured his plantar fascia in December, some said it was a huge mistake. But Olsen toed the line, saying last month that he was still mulling all of the factors when it came to playing another season or starting the next chapter in his career. In the meantime, Olsen is returning to ESPN for the second-straight year to provide Super Bowl coverage as a guest analyst. Olsen will be a special guest analyst on ESPN’s four-hour Postseason NFL Countdown pregame show on Sunday, February 3. He’ll join host Suzy Kolber and analysts Louis Riddick and Steve Young on ESPN’s set at Mercedes-Benz Stadium in Atlanta. “We’re really fortunate to have Greg join our big Super Bowl Sunday Countdown pregame show for a second straight year. 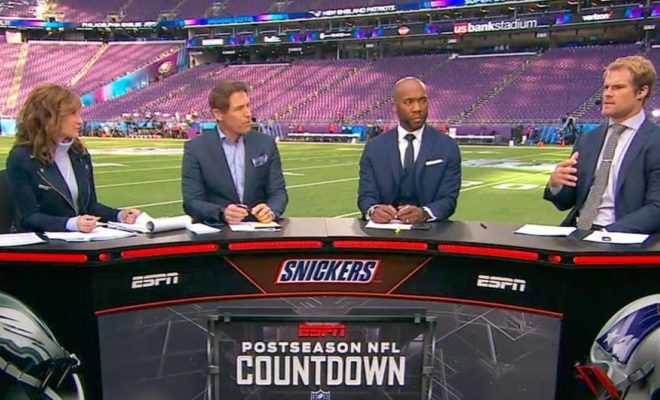 Greg has played in the Super Bowl, he has terrific insights on the game, and he knows the personnel of the Rams and Patriots and how these two teams match up,” said Seth Markman, ESPN vice president, production. So whether it’s next season or the one after, Olsen does seem to be doing two very smart things in the interim. Getting some critical reps in front of the camera and establishing a strong connection to ESPN. Both are likely to pay off whenever he decides to hang up the cleats.